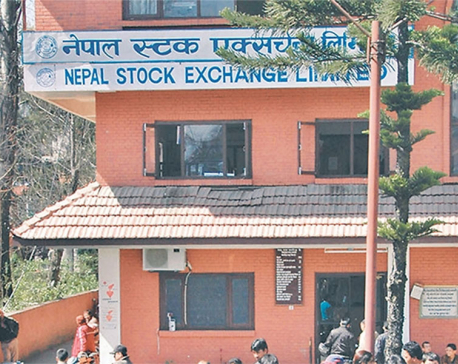 KATHMMANDU, April 15: Nepal Stock Exchange (Nepse) benchmark index plunged 17.1 points to close at 1,277.55 points on Thursday, the last day of the week. Though the stock market had seen a recovery to some extent, stocks again dived on the week ending Friday. Observers say that the rising interest rates and increase of shares in the market have sent stocks downward. “Though there were some hopes that the shortage of lendable fund will ease and the interest rates will start to fall after the government starts increasing its spending in the last quarter, it has not been the case so far,” said a broker. “Instead, interest rates are rising and banks are likely to face more pressure when a huge amount of deposit will be withdrawn to file taxes at the end of the third quarter,” added the broker. 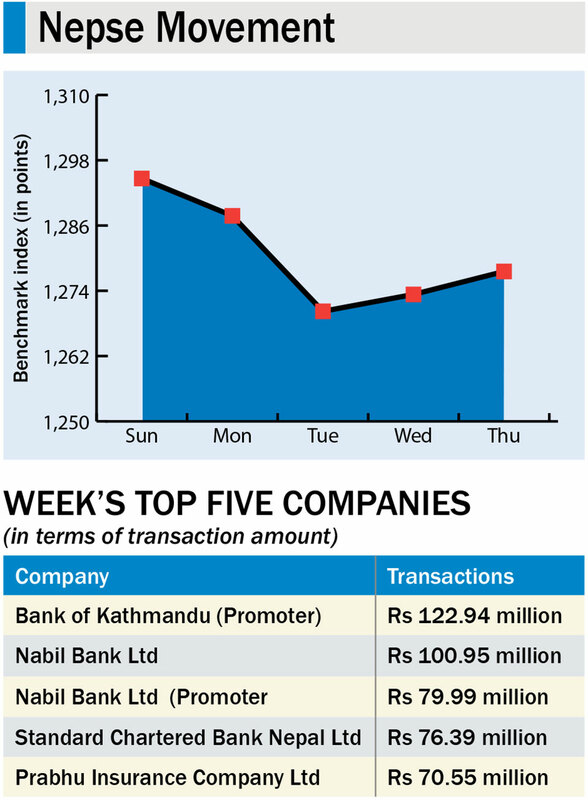 As bonus and rights shares of many bank and financial institutions and insurance companies who have increased their paid-up capital are getting listed in Nepse for the trading, there is oversupply in the market while demands are low due to falling share prices, according to observers. A total of 8.2 million units of shares of 183 companies worth Rs 2.95 billion were traded in the market last week through 36,705 transactions. The turnover is 74 percent lower than the last week. Most of the trading groups ended in the red zone. Hydropower group registered the highest loss of 58.77 points to close at 1,511.87 points. Sub-indices of Manufacturing and processing group and Hotels groups also fell 39.39 points and 38.46 points, respectively, ending at 2,264.28 points and 1,859.99 points. Development Bank ended 33.48 points lower at 1,492.18 points. Microfinance group went down 17.2 points and settled at 1,477.84 points. Banking, the heavyweight group, shed 18.77 points to finish at 1,134.04 points. Sub-indices of Finance and Insurance groups went 12.18 points and 2.59 points to end at 648.6 points and 6.161.08 points respectively. 'Trading' group remained unchanged at 209.36 points. 'Others' group, however, inched up 1.94 points to close at 713.69 points. Bank of Kathmandu (promoter) topped the list of companies in terms of turnover (Rs 122.9 million) and number of traded shares (580,000 units). Premier Insurance Company Ltd remained at the top in terms of number of transactions (1,549). Rights shares of Prudential Insurance Company Ltd as well as bonus shares of Janaki Finance Company Ltd, Sunrise Bank Ltd, Api Power Company Ltd, Nagbeli Laghubitta Bikas Bank Ltd, Civil Laghubitta Bittiya Sanstha, Tinau Development Bank Ltd, Lumbini General Insurance Company and Prime Commercial Bank Ltd were listed in the Nepse for the trading.